Growing habit near Borrego Springs, California, USA. Origin and Habitat: Cylindropuntia arbuscula ranges from central Arizona south into Sonora, Mexico. Altitude ranges: 300 to 1000 metres above sea level. Habita and ecology: It grows on in heavy soil in Sonoran desert flats, bajadas, along sandy washes and scrub. This species is not abundant and its distribution tends to be scattered. However, there are many occurrences of individual plants. Cylindropuntia arbuscula is occasionally cultivated for use in landscape planting. This species is sensitive to frost. Description: Opuntia arbuscula is a densely branched tree or shrub, up to 3 m high with many intricately branched stems from a solid trunk and thin pencil-like joints 7-10 mm wide, but not infrequently the plant is less than 1 m high and openly branched. It has small flowers that can be dark bronze to pale orange-bronze or green. The fruits are 20-25 mm long, pale green but sometimes tinged with red or purple. Stem: Main stem (trunk) well developed 10-12 cm in diameter. The ultimate segments are cylindrical, smooth, green with purple tint, 6-11 cm by 5 to 30 mm in diameter, with narrow, obscure tubercles about 1-2 cm long appearing as wrinkles when dry. Areoles: Broadly elliptic to round, 1-2 mm in diameter, 4-55 mm apart with tan to brown wool. Glochids pale yellow encircling areole. Usually only a few areoles spiniferous. Spines: 0-3 per areole, of which one longer 8-35(-50) mm long, with often 1 or 2 smaller ones under it, distributed sparsely along segments, stout, usually bent downward, light to dark grey or yellow ir reddish brown near base, ageing black with age. Each spine is clothed by a loose fitting, l yellowish or yellowish brown sheath. Flowers: Small, dark bronze to orange-bronze, about 2.5-3(-3.5) cm in diameter. Inner tepals moderately spreading, yellow, greenish yellow, or orange-bronze, broadly obovate to spatulate, 17-20 mm, apiculate. The style is white and sometimes light orange distally. The stigma lobes are pale green. Fruits: Commonly sterile, bovoid, truncate and deeply excavated at summit, fleshy, mostly spineless, green to yellow, sometimes tinged red to purplish at areoles, fertile ones stipitate, obconic, 2.5-3(-5) cm long, 1.5-3.5 cm in diameter, sometimes proliferous. Areoles 15-17(-34). Umbilicus 3-4 mm deep. Chromosome number: C. arbuscula is hexaploid (2n = 66). 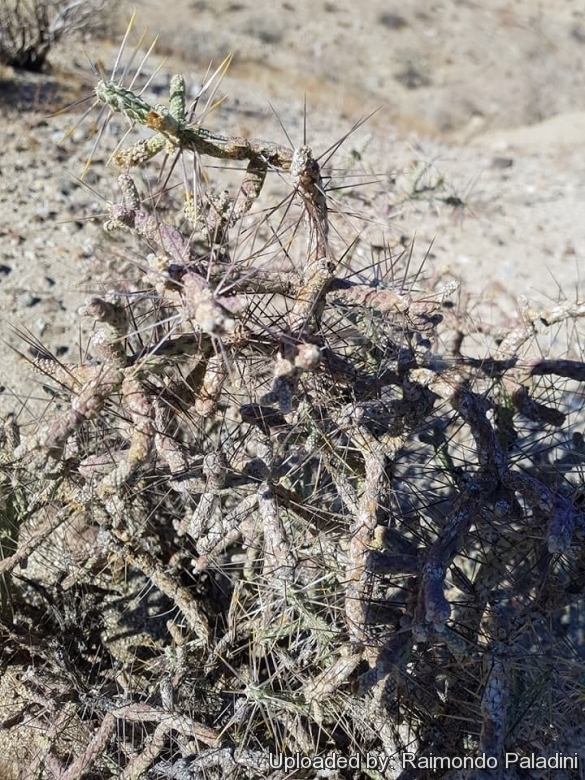 Notes: C. arbuscula hybridizes with Cylindropuntia spinosior (Cylindropuntia × neoarbuscula), Cylindropuntia versicolor (Cylindropuntia x vivipara), and Cylindropuntia leptocaulis (2n = 55). Hybrids have intermediate stems, flowers colour and fruit size. 5) Hunt, D., Taylor, N. and Charles, G. (compilers and editors). 2006. "The New Cactus Lexicon." dh Books, Milborne Port, UK. 6) Paredes, R., Van Devender, T.R. and Felger, R.S. 2000. "Cactaceas de Sonora, Mexico: su diversidad, uso y conservacion". Arizona-Tucson Desert Museum Press, Tucson. 7) Pinkava, D.J., Puente, R. & Baker, M. 2017. Cylindropuntia arbuscula. (amended version published in 2013) The IUCN Red List of Threatened Species 2017: e.T152128A121459369. Downloaded on 10 December 2017. Cultivation and Propagation: The fruits of the species are used by local people to make a drink. 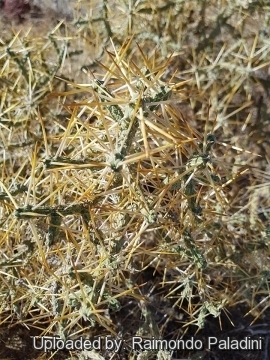 The Papago Indians utilized the young joints of the pencil cholla and similar species as a boiled vegetable but probably only in times of want.